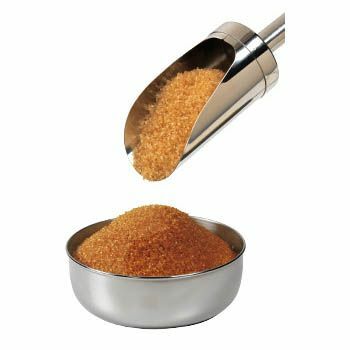 Demerara sugar is also called brown sugar because of its color. It is unrefined form of sugar it can be say that it is a raw form of refined white regular sugar. Demerara sugar is popular mostly for the backing products. It is also used by the professionals to enhance the taste of their various dishes. Demerara sugar is a more efficient substitute of refined white sugar. This sugar named after Demerara colony a colony of Guyana. This is the place where the Demerara orbrown sugar first starts to produce for selling on a large scale. Huge volumes of Demerara production also produce in the island of Mauritius, but the name is endures on the first production place. Sugar producers compress sugar cane and condense the juice of the cane. The cane syrup permitted to dehydrate. When the syrup dehydrates it leave behind golden brown crystals these are called Demerara or brown sugar. These crunchy brown crystals enhance the flavor in backing products. The Demerara sugar because of its little processing in manufacturing gives it a unique flavor. Demerara or brown sugar is more expansive then the processed sugar. – Use of Demerara sugar is highly recommended for the baking products. As the use of it in backing enhance the flavor of backing because of its molasses and creamy flavor. – It remains crunchy while cooking, that’s why it is best for to give crunchy texture to the dishes. – It is used to give toppings in bakery products, ice cream and sweet dishes. – The use of Demerara sugar in coffee and tea adds the taste more. In many countries Demerara sugar use along with the processed sugar in coffee and tea. Demerara sugar has about 11 calories per teaspoon, compared to 16 calories for refined white sugar, in the domain of nutrition it contains phosphorus, calcium, iron, magnesium and potassium. There is no phosphoric acid, sulfur dioxide or formic acid, as you found these in white refined sugar. It also contains vitamin B6, calcium and iron. Because its more natural manufacturing process than the refined sugar Demerara sugar is better for people with blood sugar disorders, such as diabetes. There are different opinions about the use of Demerara sugar there are researches that show that it is beneficial for the health in many terms. But there are also researches that shows that the only difference is between the two are because of its taste not of nutritional values. But the important thing is that it contains fewer amounts of chemicals in comparison of processed sugar.